Defoamers are also referred as antifoaming agents. These are chemical additives that reduce and hamper the foam formation in industrial processes. Defoamers are generally insoluble in a foaming medium and possess surface active properties. They offer essential characteristic such as low viscosity and spread rapidly on the foamy surface. Defoamers have affinity to air-liquid surfaces, where they threaten the formation of foam lamellas. This ruptures air bubbles and breakdown of the surface foam. The global defoamers market was valued at around US$ 7500.0 Mn in 2017 and is anticipated to expand at a CAGR of more than 4.5% from 2018 to 2026. Various types of defoamers such as oil-based, water-based, and silicone-based are available in the market. An oil-based defoamer possesses an oil carrier such as mineral oil, vegetable oil, and white oil that is insoluble in a foaming medium, except silicone oil. Wax or hydrophobic silica are added to oil-based defoamers to boost performance. Water-based defoamers are different types of waxes and oils dispersed in a water base. These waxes are long chain fatty alcohols, fatty acid soaps, or esters, while oils are often white oils or vegetable oils. Silicone-based defoamers are polymer-based defoamers formulated on silicon bases. These can be delivered as oil or water-based emulsions. Silicone-based defoamers consist of hydrophobic silica dispersed in silica oil. Powder defoamers are oil-based defoamers that are formulated on carriers such as silica. These carriers are added to powdered products such as cement, plasters, and detergents to control foam. EO/PO-based defoamers contain copolymers such as polyethylene glycol and polypropylene glycol. These copolymers offer favorable dispersing properties and are delivered as oils, water solutions, or water-based emulsifiers. Alkyl poly-acrylates are employed as defoamers in non-aqueous systems, wherein release of air is more important than the breakdown of the surface foam. Alkyl poly-acrylates are delivered in solvent carriers such as petroleum distillates. Defoamers are primarily used in the paper & pulp industry. Water-based defoamers, oil-based defoamers, powder defoamers, silicone-based defoamers, and alkyl polyacrylates defoamers are used in the paper & pulp industry. These defoamers tackle problems such as surface foam and entrained or entrapped air. Additionally, defoamers are widely utilized in the water treatment industry. Hydrocarbon-based defoamers are extensively employed in sewage treatment applications. Silicone-based defoamers are not preferred due to their high cost. Polyethylene glycol monoalkyl ether defoamers are used for desalination of water. Silicone-based defoamers are also utilized in this application to some extent. Therefore, the demand for defoamers in paper & pulp and water treatment industries is anticipated to increase in the near future. The problem of foaming in water-based paints is primarily found during the pigmentation process in paint manufacturing plants. The entrapped air within the pigment is displaced as wetting occurs and becomes entrapped in the mill base. It is also common in water-based printing inks and with solvent-based paints and inks. Silicone-based, silicone-free, oil-based, or wax-based defoamers can be used in paint and coating applications depending on their formulations and physical properties. Defoamers are extensively utilized in the sugar beet industry. They are used in fried foods such as potato chips and various other fried snacks. They are employed in the fast food industry for products such as fried chicken, chicken nuggets, and French fries. Silicone-based defoamers are used in most aerated drinks and in cooking oils to prevent foaming, while deep frying. Defoamers can be employed directly or incorporated in low-foaming cleansing agents. Demand for defoaming agents in the food industry is projected to increase, as they curb effusions or effervescences while preparation and serving. Silicone and non-silicone-based defoamers such as polyethylene oxide and propylene oxide-based defoamers are extensively used in the pharmaceutical industry. Silicone-based defoamers are utilized in the petroleum processing industry, as most foaming problems are involved with non-aqueous systems. Silicone and non-silicone-based defoamers are used in the construction industry, and a number of powder-based defoamers have been developed specifically to be included in concrete powder mixes before wetting. Demand for defoamers is high from water treatment and paints & coatings industries. Defoamers play an important role in industrial manufacturing and processing of liquid paints and coatings. They are effective in application of coatings with brushes, rollers, or more sophisticated application methods such as spray or curtain coatings. Implementation of stringent environmental regulations has led to the replacement of solvent-based systems with waterborne coating systems. Large amounts of special surfactants are utilized in water-based coatings. This has increased the need for highly efficient defoamers. Excessive foam formation is likely to result in inefficiency; long grinding time, storage instability of paints and coatings formulation, and other issues such as crater formation, loss of adhesion, gloss reduction, and loss of opacity. High usage of defoamers in the paints & coatings industry is expected to augment the defoamers market during the forecast period. 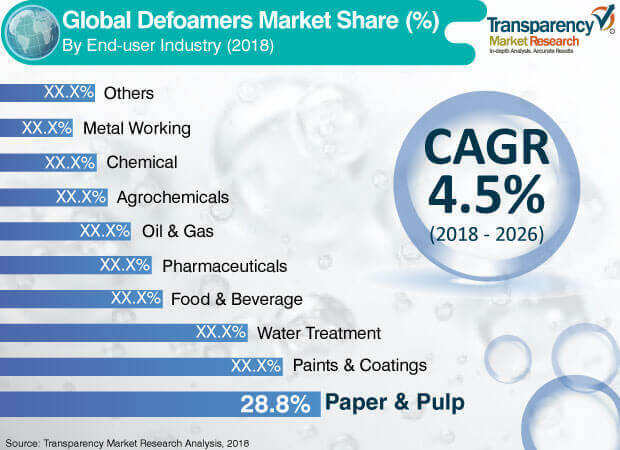 Major players operating in the global defoamers market include Ashland Global Holdings Inc., BASF SE, Clariant International AG, Dow Corning Corporation, Elkem Silicones, Evonik Industries AG, Momentive Performance Materials Inc., Shin-Etsu Chemical Co., Ltd., and Wacker Chemie AG. These are large chemical companies having dedicated manufacturing technologies and experience and expertise to manufacture defoamers. The defoamers market is highly fragmented; the top five manufacturers accounted for nearly 20% share of the market in 2017. Most of the defoamers are produced in Europe. Major manufacturers and suppliers of silicone defoamer are located in the U.S., Germany, Belgium, the Netherlands, and the U.K. Manufacturers functioning in the market are widening their distribution channels across developing economies to cater to the rising demand for defoamers in these countries. The report provides an estimated size of the defoamers market for 2017 and forecast for the next nine years. The global size of the defoamers market has been provided in terms of volume and revenue. Market numbers have been estimated based on product, end-user industry, and region. Market size and forecast for each product and end-user industry have been provided in terms of global and regional markets.